I�m always amazed by the fact that most neophyte 3D engine programmers still do not realize the simple principal and benefits of frustum culling. I often frequent the forums on flipcode and I find that there are a ton of questions regarding this subject despite the plethora of information freely available. So I�ve decided to put together this simple document outlining my frustum culling procedures that I use in my current quad-tree culled engine. There are variations and perhaps much better ways of doing some of the culling techniques but the methods presented here should suffice for learning. Before I start I want to mention one thing. I previously have used the term frustrum but I was constantly beleaguered by the denizens of the forums for this incorrect moniker. As it turns out, frustum is the correct term. I apologize to anyone whom I�ve offended... you nit-picky twits. 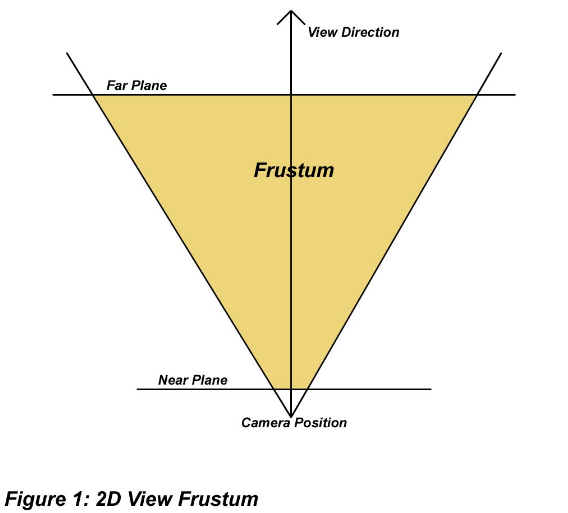 Most people already know what the viewing frustum is. For those who don�t, it�s simply the area of your world visible to your current camera. The shape of the frustum is a pyramid with the nearest peak truncated at what is deemed the �near� clipping plane (see Figure 1). In fact the frustum itself is (or can be) defined by 6 planes. These planes are named (surprise, surprise) the near plane, the far plane, the left plane, the right plane, the top plane and the bottom plane. Frustum culling is simply the process of determining whether or not objects are visible in this area. Since frustum culling is essentially a 3D world-space procedure, it can be processed long before we even deal with individual polygons in our pipeline. Hence, we can quickly reject on the object level, unlike backface culling for example which takes place much later in the rendering pipeline and works on a per-polygon basis. This means that we don�t even have to send the data to the video card once the object is frustum culled which of course makes quite a difference in rendering speed. It is simply very, very fast to render nothing. The maximum benefit of frustum culling comes from a hierarchy culling method. This means that our world is broken down into a tree-like structure. Once we cull a top level node, we don�t have to cull lower level nodes since they cannot be visible anyway. This means that we don�t frustum cull ALL the objects in our world. We simply process them in a hierarchal fashion, which greatly reduces the number of frustum culls. Without a hierarchal method, frustum culling still has a good advantage over not doing it at all but it also means that it scales linearly with the number of objects in our world. In other words, 100 objects require 100 frustum culls. 1,000,000 objects require 1,000,000 culls. At some point we end up spending so much time doing the culling anyway that we are not going to notice an increase in speed. In designing a fast game, we NEVER EVER want any of our algorithms working on a linear scale unless there are only 2 or 3 items to process or there is no better way of doing it. I refuse to accept the latter. This means that a hierarchal culling method is necessary. Consider the case where we have 100 objects, with only 1 visible, and we are going to cull them in a binary fashion (very simplistic for this example). Normally in a linear method, we would simply test every single object (all 100) and check whether or not they are visible. This of course results in 100 cull checks, although it�s possible that we could encounter an early out. Now consider a binary case. In the first check we can reduce our number to 50... the next check reduces our number to 25... the next to 13... the next to 7... the next to 4... the next to 2 and finally to 1. Six checks in total! That�s quite a far cry from the 100. And it gets much better relative to the linear method as the number of items increases. In fact in this case, the linear method has to check N items whereas the binary method has to only check log N items (log base 2). Type some numbers into a calculator and see the difference for yourself. For this example I am going to use a quad-tree for my hierarchal culling method. An octree or binary tree or any other structure could be used. In fact, most of the code will easily carry over. I choose a quad-tree since it�s inherently easy to visualize. 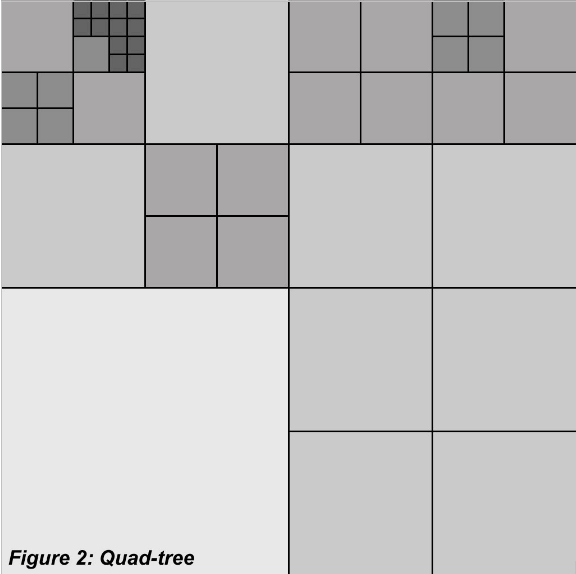 A quad-tree is essentially a 2-dimensional area constructed using a tree structure where each node has 4 children (see Figure 2). In this case, the children each occupy one quarter of the area of the parent quad-tree. This can be defined then again (recursively) for each of the children nodes. What this then forms is a hierarchy where the children nodes are contained entirely within the parent node. When we decide the parent node isn�t visible, we can safely assume that the child nodes are also not visible. By setting our world up this way we can quickly cull LARGE amounts of our world with just a simple few culling checks. This works great for a terrain engine for example. And it�s extendable as well. We can add our trees or bushes or rocks into this quad-tree into the smallest nodes which they entirely fit. Then when we perform our hierarchal culling and determine that a node isn�t visible, we can also assume that any objects (trees, rocks, etc) are also not visible. It becomes a beautiful system capable of handling large worlds with lots of objects and still running very fast. And to make the best of it, it�s very simple! The first step in planning a system like this is making sure you have the basic methods of culling up and running. 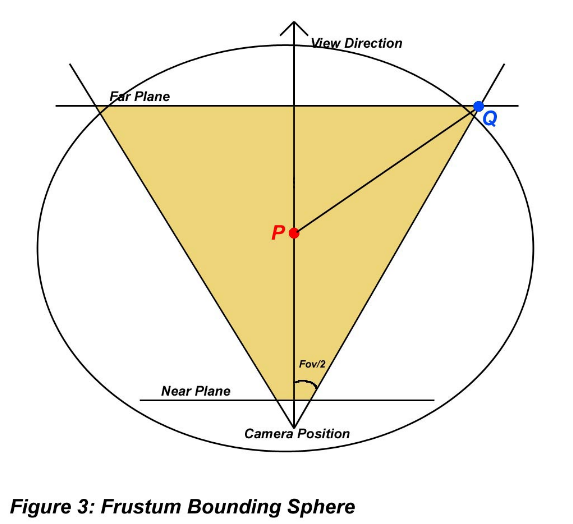 This means that we want to be able to construct the 6 planes of the frustum from our view/projection matrices as well as check whether a sphere is outside the frustum and whether a bounding box is outside the frustum. To be more concise, we want to know whether a sphere and box either is contained entirely within the frustum, entirely outside or intersecting the frustum. This will allow us to make more �tweaks� to our hierarchal culling system later on. These are the methods we will look at in this section. Our next step is to determine (in the case of a quad-tree) the status of an axis-aligned bounding box in regards to the frustum. There are a few ways of going about this operation. In this case I simply define my bounding box as a series of 3 minimum values and 3 maximum values and then compare all 8 vertices of the box against the frustum. While this isn�t the quickest way, it is certainly the easiest for the beginner to understand. The method for doing this is to test each and every vertex (corner) of the box against the frustum to see where they lie in relation to it. If all the points are inside the frustum, then the box is fully contained. If at least 1 point is inside the box but not all of them, then it intersects the frustum. If all the points are on the backside of a particular plane, then the box is outside. Otherwise, the box is considered intersecting. Why? Well, it is possible that none of the corners are inside the frustum itself but yet intersecting. In fact, consider the case where the frustum is contained entirely within the box. In this case, none of the points are inside the frustum but yet the box would still be considered visible. // were all the points outside of plane p? We now have all the tools necessary to do frustum culling. So far so good right? The first optimization for the above methods is very straightforward. If you study the two intersection methods you will most unquestionably notice that the sphere intersection method is significantly faster than the box intersection method. What this means is that we should perform sphere checks either instead of the box methods or at least before we check the box methods. In certain cases having a box as a bounding volume around our object can be much better since it will fit it more tightly. In these cases I would first check the bounding sphere of the object and then the bounding box. In fact, in my current engine each of my objects contains both a bounding sphere and a bounding box. The same goes for each node of my quad-tree. This way I can quickly reject objects/nodes using the sphere first and only if it passes that test do I check the box method. This is a very undemanding optimization and worth doing. All it requires is storing both a bounding sphere and box in each node/object that will be frustum culled. The next optimization has to do with correctly traversing your hierarchal structure. In the case of the quad-tree the general method is to start at the top node and check if it�s visible. If it is, then we then proceed to check each of the children of that node. If it is not visible, then we can stop processing. This is a recursive process for each node of the box. Once we reach the end of the tree and determine that this particular end node is visible, we send its contents to the video card for rendering. Now consider a non-terminating node (a node that contains children). If this node is completely visible, then what is the purpose of checking if the children are visible? It will only be wasted cpu cycles spent determining something you already know and that is that they are certainly visible! It is basically the opposite of not proceeding any further once you realize that the node isn�t visible. In these cases, do not check further nodes but simply add them for rendering. The only case where you need to cull children nodes/objects is when the parent node is intersecting the frustum. This can significantly reduce your culling tests and eliminate trivial and redundant work. // do we need to check for clipping? If you�ve already implemented all the previously mentioned material and profiled you application you may have noticed that the intersection code is still occupying a fairly large percentage of your cpu. Of course this depends on your application as well as the number of objects, the depth of your quad-tree, and various other factors. Even without profiling you have probably noticed that the intersection methods are fairly intensive. Even the fastest method of testing the sphere against the frustum requires testing each and every sphere against the 6 planes of the frustum, assuming no quick-outs. There are some improvements to be made. Before I get into them lets check out the methods that we will need in order to perform them. The first is a sphere-sphere intersection test. This is a very easy and fast method to implement. Basically the code computes the distance between the centers of the spheres and if this distance is less than the sum of the radii of the spheres, then we have an intersection. Otherwise we don�t. Here is the method that I use for determining if two spheres intersect. Notice how I use the squared radius values instead of computing the squared root for the length between the centers? This speeds up this method appreciably. Yep, you guessed it. Those last two methods are used for a couple supplementary optimizations. As I mentioned at the beginning of the last section, doing checks against the frustum can be quite costly so it�s best to avoid them if possible. You�ll notice that the sphere-sphere intersection test and the sphere-cone intersection tests are quite a bit zippier than the frustum intersection methods. So we can put those to use as a first level culling method to reduce the number of cull calls sent to the slower methods. What we need to do is to construct both a sphere and a cone around the current frustum. Then we can check our bounding spheres against this frustum sphere and then the frustum cone to grossly reject objects that are just plainly out of view. This is a very fast method (or methods) and depending on the layout of your world can result in some nice speed improvements. // camera. Position() returns the position of the camera. // fWidth is half the width of the screen (in pixels). // fHeight is half the height of the screen in pixels. // m_fFovRadians is the FOV of the frustum. This pretty much sums up a good introduction to frustum culling that I hope many newbie engine programmers will find practical and helpful. As you can see by reading this, none of the concepts are hard and the math is very simple. There are of course many more optimizations that can be done to further enhance the culling procedure but this should serve as a good starting point. If anything sounds vague in the document, please let me know and I�ll try to write an update to clarify. I would like to thank Gil Gribb and Klaus Hartmann for their excellent article on plane extraction. I would also like to thank Dave Eberly for his excellent resources for this cone/sphere intersection description as well as the full site he maintains. It has been an invaluable resource to me as I�m sure it has been for many other programmers as well. I would also like to thank Charles Bloom for his web page that first inspired me to try enclosing the frustum in both a sphere and a cone. I feel really dumb for not thinking of it myself but that�s the beauty of sharing information. And remember... Go vegan and exercise like hell - it WILL make you smarter or your money back. I guarantee it (not a guarantee).